Would you be surprised if you came face to face with a Red-eared Slider, Gypsy Moth or Brown Bullhead? Would you know what to do if Dalmatian Toadflax or Giant Hogweed landed in your neighbourhood? Alex Van Tol can help. 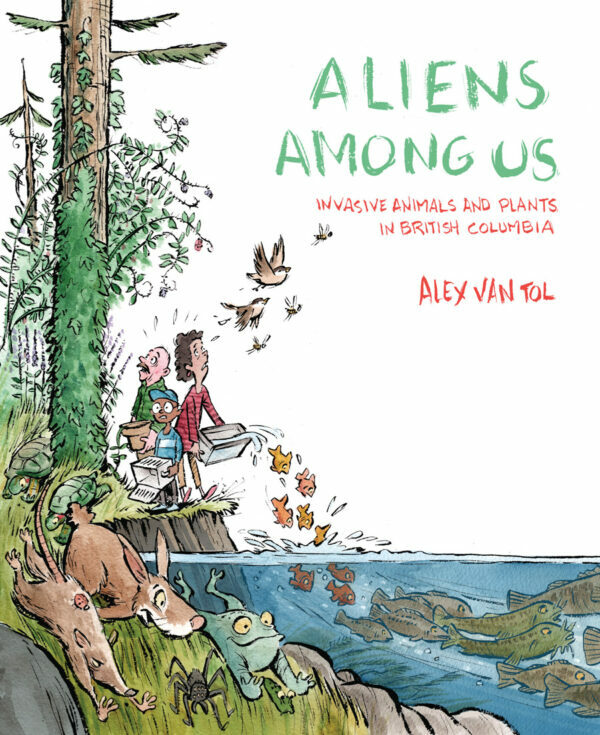 In Aliens Among Us, she identifies more than 50 species of animals and plants that have invaded British Columbia. With the help of colour photographs and illustrations, she exposes the invaders, then explains how they got here and what they’re doing to the environment. Alex Van Tol has harvested the knowledge of museum biologists to alert the next generation of responsible environmentalists. Her list of serious invaders includes the colourfully named Purple Loosestrife, Violet Tunicate, Eastern Grey Squirrel and Yellow Perch, species that tend to take over an area and crowd out or destroy native species. She names the creatures that can eat their way through an ecosystem, like Smallmouth Bass, Gypsy Moths and American Bullfrogs, as well as those that cause damage to property, like Norway Rats and European Starlings. And she points out the species that might do serious harm to humans and other animals, such Rockpool Mosquitoes, Giant Hogweed and Poison Hemlock. Some aliens, like European Wall Lizards and Giant Garden Slugs, haven’t yet posed problems in BC, at least not that we’re aware of – but they still need to be watched. And finally, Van Tol raises the alert species that haven’t yet arrived but may be coming soon, like Northern Snakeheads, Fence Lizards and Zebra Mussels. This readable and alarmingly informative book will help young people prepare for the invasion, and arm them with the tools to stop the spread of unwanted aliens in British Columbia. A former middle school teacher, Alex Van Tol has written numerous books for young people. She claims that Aliens Among Us has been the most fun to research and write, because she learned so much in the process. She lives with her two sons in Victoria, BC. Mike Deas has illustrated or written several books for young readers, including Dalen and Gole and the Graphic Guide Adventure series. He grew up with a love of illustrative storytelling and Capilano College’s Commercial Animation program helped him fine-tune his drawing skills and imagination. Mike lives with his family on sunny Saltspring Island. Congratulations to Aliens Among Us for making it onto the BC Bestseller List for the week of October 11, 2015! “The author uses an engaging voice to educate readers about alien and invasive species to British Columbia. The author provides an introduction to the topic and why it is an important topic to discuss. The author then goes into detail on each alien species that has been introduced and its effects on the local environment. Side bars provide extra entertaining factoids that engage the reader. Hand drawn illustrations as well as photographs detail the creatures and botany discussed. The book also contains a table of contents, glossary of terms, scientific names listing, sources, and index. “The book is expertly illustrated with close up photos, as well as cartoon style drawings that enhance specific details in the text. For instance, you’re not likely to ever use a Giant Hogweed stem as a pea shooter after seeing the effect it will have on your lips!